How to choose the best business management software? For many years, ERPs were reserved for very large organizations. Their integration took a long time and required huge budgets... Fortunately, those days are over! Business management software is now quite democratized and allows all companies to benefit from their power. In other words, it is high time to move up a gear! We have therefore prepared this practical guide for you so that you are ready to make THE right choice business management software for your company. 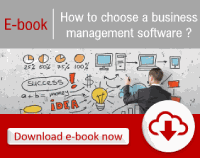 How to choose a business management software? We support our customers in the implementation, integration, development, maintenance and hosting with a proven project method on more than 200 projects, business management software.